SUTHERLAND SPRINGS, Texas (AP) — As usual, John Holcombe posted his Sunday school lesson online a day ahead. It was about an Old Testament miracle. Holcombe was expecting a small miracle of his own. His wife, a widow and mother of five, was pregnant with their first child. 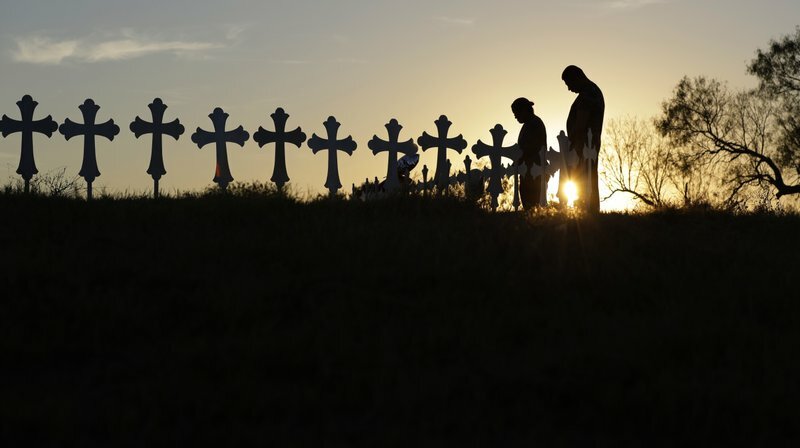 But the following morning, his family would bear an unspeakable burden: nearly a third of the fatalities in Texas’ worst mass shooting. The massacre inside their church in the tiny Texas town of Sutherland Springs spared Holcombe’s life, but not the lives of his wife, three of her children, his parents, a brother and a toddler niece. They were among 26 people fatally shot during the shooting rampage Sunday that also killed several members of at least one other extended family, a couple visiting for the first time, the pastor’s teenage daughter and other church goers. Investigators said the victims ranged in age from 18 months old to 77 years old. Hundreds of shell casings and 15 magazines that hold 30 rounds were found at the church, authorities said. Holcombe and his 36-year-old wife, Crystal, had recently married, said Julius Kepper, who lives about two blocks from the church. Holcombe suffered shrapnel wounds and Crystal’s youngest child, Evelyn, was grazed by bullets but both were discharged from the hospital on Monday, Crystal’s aunt, Michele Hill, told the AP. Crystal’s eldest child, Phillip, had stayed home from church that day, Hill said. She added that Crystal was due in early April. “They had actually just found out. They didn’t think it was possible so this was just a miracle baby,” Hill said. Michael Ward rushed to the church after he was abruptly awoken by his wife, Leslie, when she heard a peal of gunfire from that direction as she set up a yard sale. Ward told The Dallas Morning News he found and carried out his 5-year-old nephew, Ryland, who had four gunshot wounds. The boy was flown to University Hospital in nearby San Antonio, but the child’s mother and two of his sisters were killed. On Monday, the yard sale was still set up, with clothes laid out or hung on plastic racks, along with kitchen items. No one was there. Another victim was the pastor’s 14-year-old daughter, Annabelle Pomeroy. Her parents were both out of town during the shootings, which also wounded about 20 people. Another young victim was 16-year-old Hailey Krueger, the church and family members confirmed on social media. Investigators said the gunman, Devin Patrick Kelley, had recently sent threatening texts to his mother-in-law, a member of the church, and the shooting appears to have been driven by domestic tensions. Kelley was formally ousted from the Air Force for a 2012 assault on his ex-wife. He was found with a self-inflicted gunshot wound Sunday after he was chased by two community members and crashed his vehicle. Kelley’s mother-in-law wasn’t at the church Sunday. But his wife’s grandmother, 71-year-old Lula Woicinski White, was attending the service and died in the shooting, according to family members. Her stated occupation on Facebook: doing whatever was needed at the church. Karen and Scott Marshall had recently retired to Texas from Pennsylvania and were visiting the church for the first time when they were killed, Scott’s father, Robert Marshall, told the Pittsburgh Tribune-Review. He said Karen Marshall had returned to Texas after finishing an assignment at Maryland’s Andrews Air Force Base, while her husband, an Air Force retiree, had been working as a civilian contractor and mechanic at Lackland Air Force Base, about 40 miles (64 kilometers) west of Sutherland Springs. Crystal Holcombe was an industrious mother who studied karate, loved to bake and raised goats. Images she posted last month showed her 11-year-old daughter Emily placing third in a county archery competition, while others showed her children standing behind cookies and cakes they’d made for a bake sale. Emily was among the children killed Sunday. Wilson County sheriff’s deputies were posted outside the Holcombes’ home, which is across a dusty two-lane road from grazing cattle. It’s a short drive from First Baptist Church. It’s also close to the Wards’ home, where an American flag has been mounted on the fence upside down since the shootings in Las Vegas on Oct. 1, an apparent memorial to the 58 victims of that attack, according to neighbors. 0 Response to "Relative: Pregnant woman, 3 children, in-laws slain in Texas"